This is a new section of the Owner's Pride. It's for "fan-made" memorabilia and the like. If you have anything Adventure Vision that you have made, please email me the details and I'll add it here. #6. Adventure Vision/PhillyClassic T-shirt #3. #7. Adventure Vision/PhillyClassic T-shirt #4. #8. Will Fong's Adventure Vision marquee. #9. AdventureVision/East Coast Gaming Expo2 T-shirt #5. Here are some very lucky individuals who own Adventure Vision systems and/or cartridges. Some of us had parents who bought us one when we were younger, others have worked long and hard in finding one. At any rate, this is a tribute to our Adventure Visions. 21. ??? Maybe you're next ??? Thanks go to everyone listed here for taking the time and effort in sending me their stories. 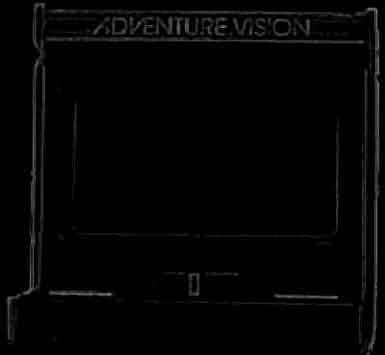 If you own an Adventure Vision system or cartridge and would like to be included on this page just take a picture of your item(s), or better yet, take a picture of YOURSELF with it and send the picture to me. Also include, if you want, your name, city, state, country, and anything else you feel relevant.